Microsoft's HoloLens aims to 'to break the walls between humans and technology' by superimposing a holographic display onto a wearer's vision. Orders for the augmented reality goggles started at the end of March, and now Microsoft is hoping to make them available to a wider audience. Its operating system, named Windows Holographic, is being opened to partners interested in building devices for 'mixed reality' experiences. Devices built on the Windows platform will be interoperable. This means that someone wearing HTC Vive virtual reality gear would be able to virtually visit and collaborate with someone using HoloLens virtual reality goggles, Microsoft executives told AFP. The list of partners already working with Microsoft include HTC, Lenovo, Asus, and HP. 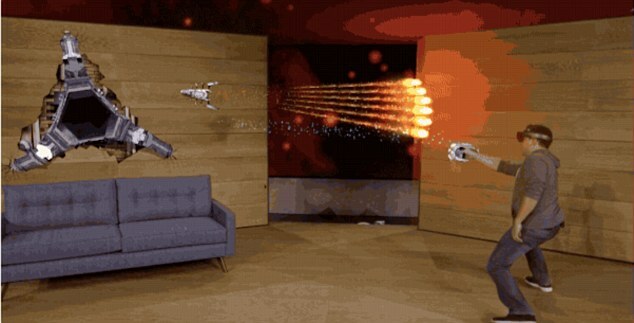 Microsoft said it built HoloLens to showcase the potential for the technology, which is based on the same Windows operating system that powers computers, smartphones, Xbox consoles and more. Sharing the Windows platform will mean that augmented or virtual reality gear from various manufacturers will be able to work with one another, the same way Windows computers do. 'We are bringing the software that lights up HoloLens to the entire ecosystem of mixed reality devices –- and inviting partners to join us in this platform,' Microsoft spokesman Greg Sullivan told AFP. While virtual reality devices such as those from Facebook-owned Oculus and Sony's PlayStation unit immerse users in fantasy worlds, HoloLens 'augments' reality by overlaying holograms on the real world in view. HoloLens lets users interact with virtual objects using hand gestures. Microsoft would not disclose details regarding how it will make money from the move. But it is expected to pursue the kinds of licensing deals it negotiates with companies that make Windows-powered computers. Creating a common platform for a wide range of companies to create and market mixed reality gear promises to bring down prices for altered reality gear while enriching variety in the marketplace. Microsoft in March began its first shipments of its HoloLens to application developers, staking its place in what is expected to be an emerging computing platform. At a recent Microsoft Build developers' conference, the company showed some of the possibilities for HoloLens. This includes giving users a view of Mars that up to now could only be seen by space vehicles, and an inside view of the brain by medical specialists aiming to deal with a cerebral tumor. 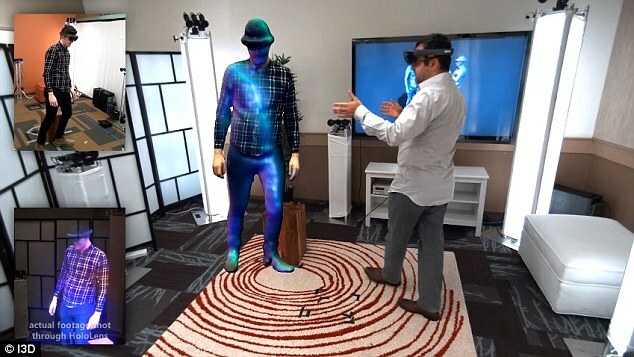 Aiming to encourage new applications for the device, Microsoft noted that developers can create 'new mixed reality' with holograms to enable users to see and experience things in new ways. The holographic capabilities in the Microsoft gear can open doors for developers to augment tasks from complex surgery to motorcycle design, according to the company. Marketers predict virtual headsets will soon top wish lists for kids and young adults from Silicon Valley to Hong Kong. But some analysts say virtual reality will be eclipsed by augmented reality within a few years.